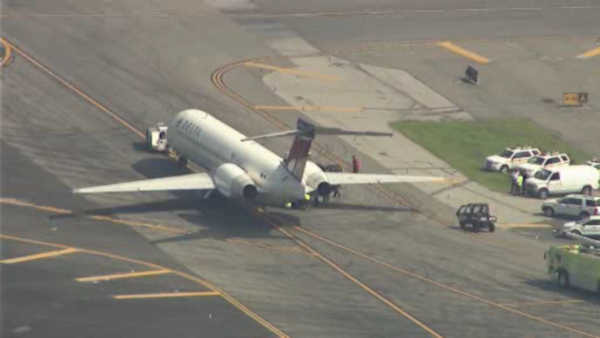 EAST ELMHURST, Queens -- Authorities said a plane has landed safely at New York City's LaGuardia Airport after reporting a blown tire. A Federal Aviation Administration spokeswoman said the Boeing 717 blew a tire as it touched down just before 3 p.m. Monday. Arlene Salac said the Tampa, Florida-to-New York flight was held on the taxiway for inspection. The tire on the Delta flight was repaired while passengers waited on board. The Boeing 717 was then towed to the gate where everyone got off. None of the 115 people on board were injured. A press representative for the Atlanta, Georgia-based airline didn't immediately return a message seeking comment on the landing.